CAN THIS DEVICE CONTROL THE WEATHER? CAN IT BE USED TO PRODUCE A SORT OF DEFENSIVE SHIELD? SOME SCIENTISTS ARE SAYING THAT SIGNALS AND DATA EMANATING FROM THE SITE, CAN BE EASILY TRACED AND POINT TO THE FACT, THAT IS EXACTLY IT'S MISSION!!! LETS TRAVEL TO A FEW SITES THAT HAVE THE HARD DATA POSTED AND SEE WHAT THEY HAVE TO SAY! BELOW IS THE STATED PURPOSE OF THE PROGRAM COPYED DIRECTLY FROM THE HAARP HOMEPAGE. 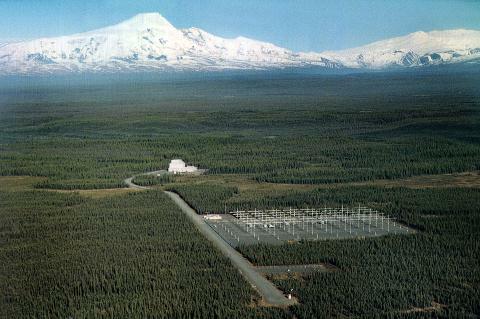 The ionospheric research instrument (IRI), a high power transmitter facility operating in the HF frequency range. The IRI will be used to temporarily excite a limited area of the ionosphere for scientific study. 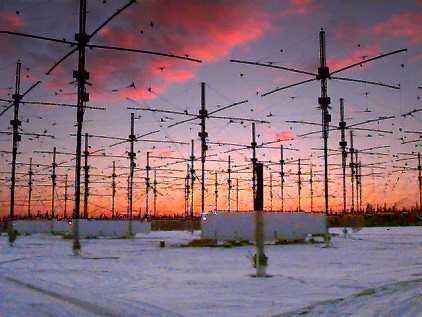 In addition, diagnostics installed at the HAARP facility will be useful for a variety of other research purposes including the study of global warming and ozone depletion. LETS VIST THE SITES BELOW AND SEE WHAT THEY HAVE TO SAY!!! Bright Skies: Top Secret Weapons Testing?